Dental Implant Bangkok, Dental Implant Thailand. Without your natural teeth you may find that there are many things you miss. You may miss having your natural smile miss. You may also miss the pleasure of crunching into an apple or sinking your teeth into a mouth - watering steak? Perhaps you feel a little self-conscious about eating or speaking in public. Perhaps your remaining teeth are shifting or you suffer from muscle strain and headaches. Do you miss the comfort and confidence you once took for granted? Whether you've lost one tooth or several, whether it's a recent problem or something you've lived with for years, you've never fully adjusted to losing such an important part of yourself. If you have experienced any of the above you are most certainly not alone. However, modern dentistry has come a long way in recent years and there is no need for you to continue living in discomfort. If you are the one who is looking for a Dental Implantswith specialised implant dentists and Dental Implants Technology from Silom Dental Building Clinic in Bangkok Thailand, you can have replacement teeth that look, feel and function like natural teeth. Teeth that are comfortable and stay in place allowing you to speak, smile and eat with confidence. 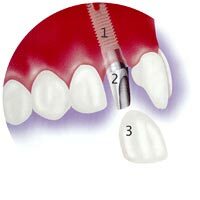 These are replacements that can be inserted without affecting any of your remaining teeth. Naturally, the effects of tooth loss vary from person to person and depend on what have been lost. Losing a crown means losing the visible part of your tooth and this may affect your confidence. However, if you lose the root as well, you have lost the unseen part of your tooth and although this may not affect you aesthetically, it is undoubtedly the most important part of the tooth. A dental implant is made of titanium and shaped like a screw. The dental implant is placed into the jawbone and serves as a secure root for the new tooth. Once the dental implant is in place, several different types of dental restorations, such as crowns, bridges or dentures, can be attached. There are several situations where dental implants may be considered. (1) Dental Implant replacement of a single tooth. (2) Dental Implant replacement of several teeth. (3) Dental Implant replacement of full upper or lower jaw.